Were they saying "so long" all along? Oh my heart. So that’s what we’ve been doing these past few days and will try to convey in the coming weeks (or for as long as we can sustain it): Looking over the catalog of our favorite things from 2011 in order to get excited about what lies ahead. There’s no rhyme or reason to the order of this list-making, really; it’s just a jumble of ideas and items, provided to distract you from whatever it is you need to be distracted from. Ain’t that just like Scribbleskiff? In terms of music, or at least in terms of the music and musicians we at Scribbleskiff adore, 2011 was a love-in. So many singles, EPs, and LPs, from start-ups and stalwarts alike, were just too tempting to resist. So we didn’t, and over the next few postings we’ll offer a few selections, along with some suggestive excuses, why that we think you should succumb too. 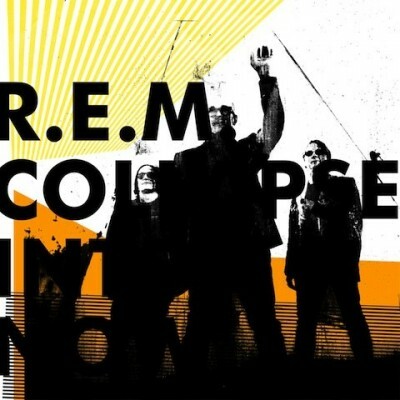 And, speaking of stalwarts, what better way to start our sort-of “best of” list than with “All the Best” from Collapse Into Now, the newest (and, as it turned out, final) collection of new material from R.E.M. The second cut on the LP, “All the Best” explodes from your speakers, bursting with the band’s trademark tricks of the trade: jangly, crashing guitars, Stipe’s familiar speak-crooning, and a kick-slapping drum and bass line. Despite its placement on their 15th studio recording, “All the Best” could easily fall in line with R.E.M.’s earlier raucous rockers, like “Begin the Begin,” “What’s the Frequency, Kenneth?” or “The One I Love,” which it echoes in a number of ways. Too bad. We weren’t ready to see them go and were looking forward to more murmuring. Because, despite the distortion from all the qualifiers (“not as good as [insert favorite record title]”) and decriers (“they should have quit after [insert least favorite title]”), we enjoyed Collapse Into Now as much as anything in the R.E.M. catalog, and we turned to it as often as the other 2011 releases by quote-new-unquote bands that we flipped for, like Yuck and Wild Flag. But don’t despair. R.E.M. may be gone, but we’ll be back soon to talk about more of “all the best” from 2011 — in beers and books, too. As well as what we are looking forward to in 2012, so stay tuned. As always, tell us what you think. Do you have a favorite song or record from this past year? Is there a new band you’ve discovered and want to tell others about? Let us know by leaving a comment below.